The Flexile Sentry is a merciless creature whose purpose is purportedly to punish the Undead. By the descriptions of its deeds, it seemed to fill the role of an executioner or one that would eradicate the Undead. It did this by cramming inmates of the overflowing Lost Bastille onto a rickety ship and casting them out to the open sea. A former King, likely its creator, commanded the Flexile Sentry to deliver those who had no cells to a faraway land, and to make certain they were never heard from again. The majority of these unfortunate souls drowned or starved, but a few hardy survivors made land to the south and imparted their knowledge of sorcery to the people there. We know that Melfia is to the south of Drangleic, and that it has deep roots in both sorcery and pyromancy. We also know that Olaphis, a kingdom that once existed on the same spot as Drangleic does today, once flourished in its knowledge of sorcery. Straid, a member of the King’s court in ancient Olaphis by invitation, was captured and turned to stone in the Lost Bastille when the King of the time began to see the progenitor of the curse in anything and everything. All this evidence points to the creation of the Flexile Sentry by the King of Olaphis (Alvis? ), and gives us the origins of the Melfian nation. Interestingly, it may also explain the fate of Olenford, who is revered as the father of sorcery in Melfia, as we also know from the Varangian Sword description that during this King’s reign sorcerers in particular suffered dreadfully. Therefore, it is likely that Olenford was one of these unfortunate castaways. The Flexile Sentry appears to be reptilian in nature, but is conjoined at the base of the spine. Like the Executioner’s Chariot, it may reflect the soul of whoever created it in some way. 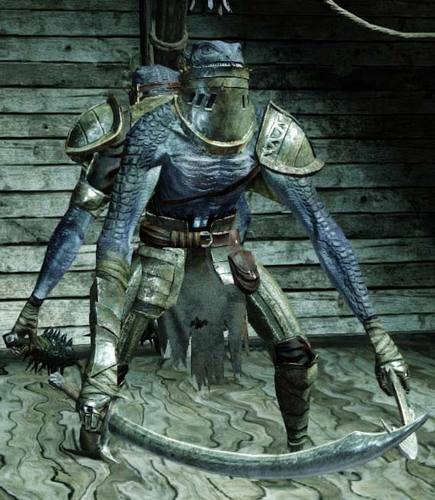 The Warped Sword description says that its weaponry was once straight, but later twisted to reflect its warped owner. 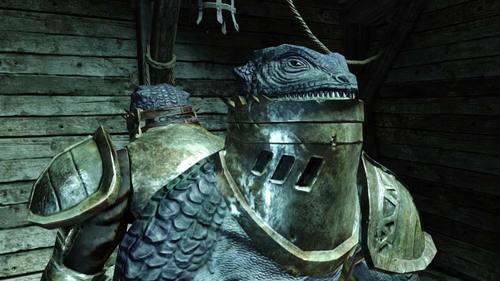 The Flexile Sentry creation appears to have been used throughout the history of the land that Drangleic occupies. To the North in Eleum Loyce we discover further Flexile Sentries, indicating the Ivory King either created or utilised them. In the Shaded Woods we find a Flexile Sentry guarding some remains that hold the Dragonslayer’s Crescent Axe. The Suspicious Shadow set says that King Vendrick hired adept assassins from Mirrah to put down those who were cursed. In the same way, King Vendrick may have utilised the Flexile Sentry to ferry those who were cursed away to the Lost Bastille, following the same path as the King of ancient Olaphis.